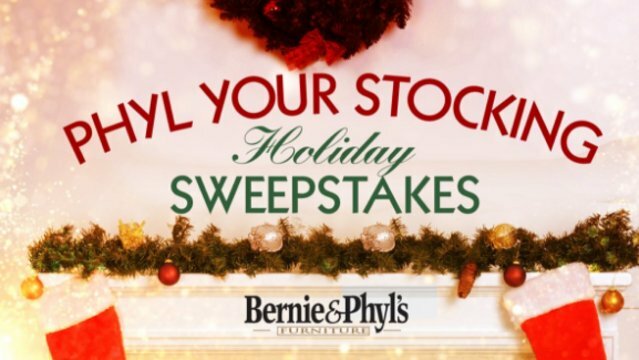 Fox 25 Boston brings you the Bernie & Phyl Your Stocking Holiday Sweepstakes where they will be giving away a new prize every day to one lucky winner until December 21, 2018. How To Enter: You must watch Boston 25 Morning News broadcast (the “Show”) from 7:00 a.m. EST to 8:00 a.m. EST each weekday during the Sweepstakes Period for Holiday Word of the Day. Once you know the Code Word Of The Day now go to this link and follow the online instructions to register by entering all information requested on the registration form. Prizes: Fifteen (15) Prizes: December 3, 2018: Crete Beige Illusion 5×8 area rug. Approximate retail value (“ARV”): $239.99; December 4, 2018: Vernon cocktail table. ARV: $399.99; December 5, 2018: Queen or King Braylen Metal. ARV: $399.99;December 6, 2018: “Around the Bend” 3-D artwork. ARV: $439.95; December 7, 2018: Barnburner 4 Merlot Media Chest. ARV: $549; December 10, 2018: Baja Leather-mate Rocker. ARV: $599.99; December 11, 2018: Santa Rosa 5pc Merlot Pub Set. ARV: $699.99; December 12, 2018: Daniel’s Amish Queen or King bed. ARV: $799.99; December 13, 2018: Wilenburg King Size upholstered bed. ARV: $799.99; December 14, 2018: Spectrum Indigo Sofa. ARV: $999.99; December 17, 2018: Tyler Creek dining set. ARV: $1,099.99; December 18, 2018: Sealy Posturpedic Cushion Firm Queen set. ARV: $1,109.99; December 19, 2018: Savesto Charcoal 5pc sectional. ARV: $1,699.99; December 20, 2018: Serta iComfort 2pc King Blue mattress. ARV: $1,979.99; December 21, 2019: $5,000 Bernie & Phyl’s Gift card. Total ARV of all prizes is:$16,818.83. Who Can Enter: Open only to legal residents of the states of Massachusetts and New Hampshire who have reached the age of 18 years old at the time of entry. When To Enter: This sweepstakes entry begins at 7:00 a.m. Eastern Standard Time (“EST”) on December 03, 2018, and end at 11:59 p.m. EST on December 21, 2018. Who’s Sponsor: The Fox 25 Boston Phyl Your Stocking Holiday Sweepstakes is sponsored by Cox Media Group Northeast, LLC d/b/a WFXT-TV.